Soccer took front stage in Pittsburgh on Wednesday night — as the Riverhounds hosted the D.C. United of Major League Soccer before a festive, over-capacity crowd at Highmark Stadium in the fourth round of Lamar Hunt U.S. Open Cup. The Riverhounds fell behind early, but battled back to tie the United and extend the match to extra time. In the end, DC two corner kicks, one in the 8th minute, and another in the 93rd minute, were enough to help the United advance in the Open Cup. Despite the loss, it was a positive Open Cup run for the Riverhounds, as they proved that they could play with one of the the top teams in MLS. And maybe even more importantly, as a franchise that struggled a bit out of the gate this year with attendance, it had to be satisfying to host a game like that — with a fabulous turnout and atmosphere. For the gradual, and incremental growth of bringing soccer in Pittsburgh to a wider audience, it was another nice building block. The foundation started in 1999 with the birth of the Riverhounds, but has since sprung to life with Highmark Stadium. Along with opening night at the new stadium in 2013 — and the friendly against Wigan Athletic F.C. that July, this competitive tournament match against one of the most recognized brands in North American soccer — are the type of games the Riverhounds will have to continue to occasionally provide along with their usual slate of league games. 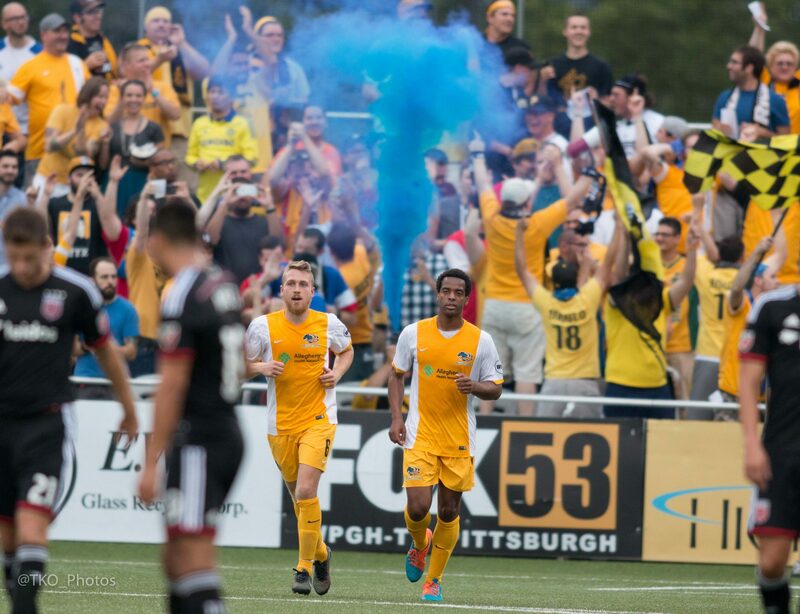 The packed house, announced as 3,918, filled completely around the stadium into the river side standing room only area, with many fans following the Riverhounds directive to wear gold, brought a great deal of energy to the match. “I’ve been in big stadiums for sell out games, and little stadiums that have been sold out. And this was great tonight,” said Ben Olsen, D.C. United’s Head Coach. “This crowd was unbelievable. When we were out there early, during warm-ups, there had to be a good thousand or so people already in their seats. The Steel Army (Riverhounds supporters) were already there — singing and chanting,” said Kevin Kerr. There were moments throughout the match where the fans were shaking the stands (and giving us a bit of an uneasy feeling in the press box!). The Steel Army, in their usual spot filling in the South end of the field, were bright, loud and set the tone. It wasn’t that way early in the season — when the Hounds began play with four of their first five matches in late March and early April at home before sparse crowds. In fact, I had written about this at the time — and pointed out that one of the things they needed was a game like this — against an MLS opponent (or a friendly against an international side). There is no guarantee that they will get an MLS opponent here every year but if they are successful on the field in Open Cup play, they will have their chances. The Riverhounds were fortunate in that they won the coin toss held by U.S. Soccer to determine the host of both the third and fourth round matches. As the match ended on Wednesday, most of the crowd had remained for the full 120 minutes stood up and applauded both teams for a pretty hard fought effort. A fitting end to a memorable night in which showed that Pittsburgh fans have great appreciation for a well-played soccer game. About 20 minutes into the match, the D.C. United were leading 1-0, and while they seemed to drop off in terms of putting high pressure on the Riverhounds back line, they were in control of the match. The Riverhounds were bottled up, not able to really create much possession through the middle of the field. They started to send long passes forward from beyond the midfield line, over the top to the attacking third. The primary target was Kerr. The D.C. back line is a big, strong group. “Oh — they have some big boys – yeah,” remarked Kerr after the game. Kerr is about 5’9″ — and maybe weighs more than 150 lbs soaking wet. Yet it was Kerr — and not their bigger target forward Miro Cabrilo — that was having success in battling the D.C.’s back line for balls. While Cabrilo and Mike Green drew the central defenders, Kerr took on the United’s outside backs with reckless abandon — outworking them many times for balls in corners. In the first sequence of the match he was able to track down a ball played toward him from the kickoff — and got a cross into the box. It seemed like that would set the tone for the night. Kerr kept encouraging his teammates to keep sending him balls forward. Eventually, he got the better of Kofi Opare in the 24th minute to set up the Hounds goal. As Opare attempted to shield Kerr away from a long ball that he got to first, the Scottish midfielder kept fighting for the ball. Opare pushed Kerr away as the two were just inside the penalty area. “Persistence,” remarked Kerr when asked about what it took to create that penalty kick opportunity. Vincent took care of it from there. Kerr’s tireless work rate continued through the match. Don’t let the success he’s had with tracking down the ball into the corner fool you. Kerr is just as effective, and dynamic with the ball on the ground, playing one-two touch soccer and using his foot skills to beat his man off the dribble. He had three shots on target– and set up numerous other corner kicks — giving the D.C. United back line fits all night. Kerr along with the United’s Miguel Aguilar were the two most dynamic players on the field. It seems like he has epitomized and inspired his team’s efforts all year long. 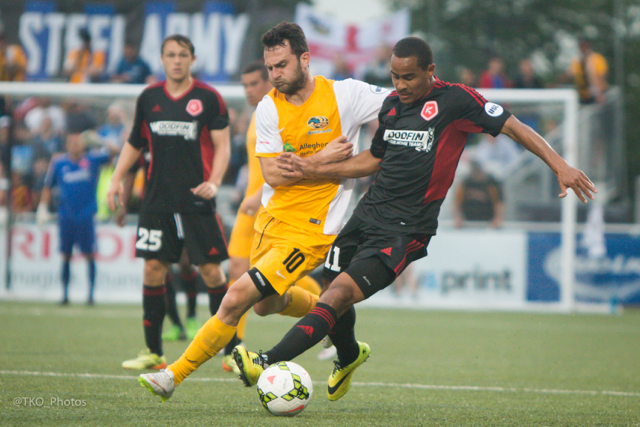 The Riverhounds hope that it will continue as they hit the middle of their league season. The Riverhounds effort last night was on par with most of the rest of their USL counterparts in the Lamar Hunt U.S. Open Cup Fourth Round matches played on Tuesday and Wednesday. Only one USL team won. Charlotte Independence fresh off their big win over the Hounds on Saturday, traveled to Boston and knocked off the 2014 MLS Eastern Conference Champions — New England Revolution. Former Riverhounds goalkeeper Hunter Gilstrap, on loan from the Carolina Railhawks, had the clean sheet. Many of the other matches were decided in the late stages, went to extra time and some decided on penalty kicks. Olsen, who led the United to Open Cup victory in 2013, wasn’t the least bit surprised by the quality of the Riverhounds effort on Wednesday. “I’ve been involved with Open Cup games for what, 17, 18 years, this is what it looks like almost every time,” said Ben Olsen, D.C. United Head Coach. The Riverhounds stay home this weekend. The Montreal Impact 2 team that is in last place in the USL’s Eastern Conference pays a visit to Highmark Stadium on Saturday night. It will be a 7 p.m. kickoff.